Are you surviving the cold/flu season? Aren’t they cute? This is the first time that I have ever seen Heartzels! Chips were on my shopping list … but the pretzels were the highlight of my shopping trip! 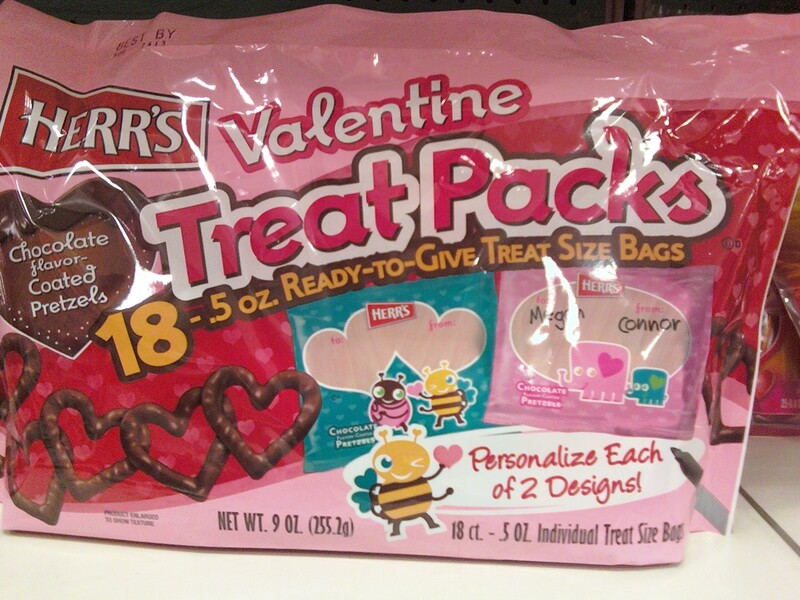 In each bag of Heartzels (.7 oz.) 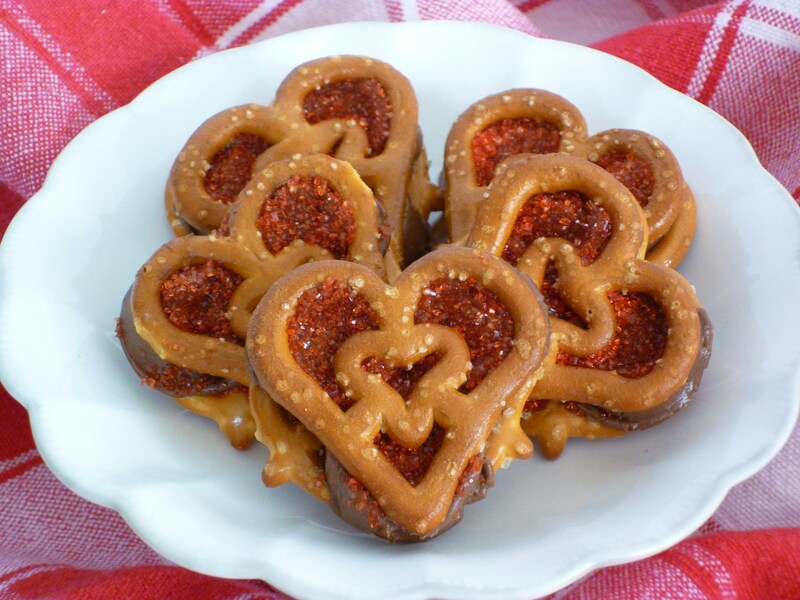 were only about 9 whole heart shaped pretzels and some broken ones … so I used mini twist pretzels on the bottom of these little treats and Heartzels on the top. Heat oven to 325°F. Line a baking sheet with parchment. 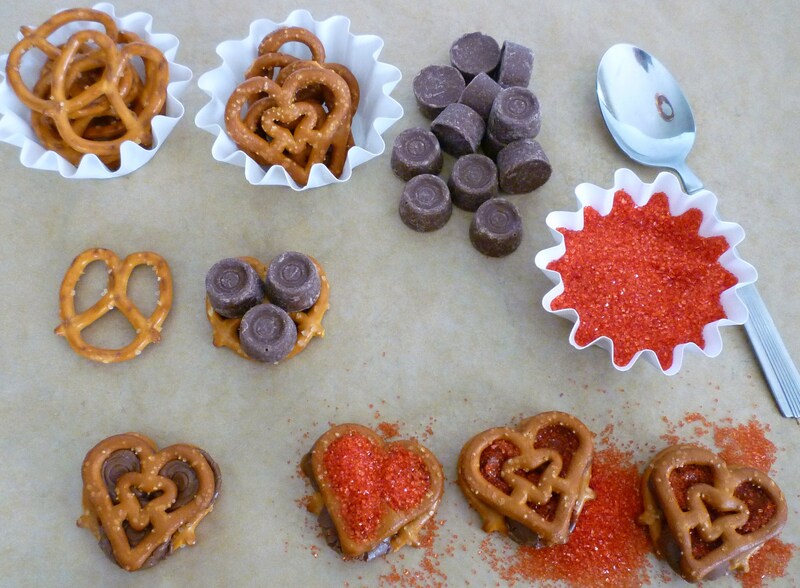 Lay mini twist pretzels on parchment and 3 mini Rolos on each pretzel … can you see the ♥ forming? Remove from oven, top each with a Heartzel and gently press to slightly smash the Rolos, creating a little sandwich, sprinkle with red sugar immediately … chill for a few minutes or let sit at room temperature until chocolate hardens. Tap off all excess red sugar … don’t forget to save the extra sugar for another project! You are so creative! Love it!! WOW, haven’t seen those heart shaped pretzels either. They are so, so cute. Nothing better then a chocolate filled pretzel and then maybe a very lite drizzle with white chocolate………yum, yum. when buying chips, pretzels, milk, etc. always get the ones in the back as they are the freshest. Even the flu can’t stifle your creative juices. Lucky us. Thanks for the heads-up on the new pretzel shapes. When employees stock the shelves, little do they know how easily pretzels & chips break. I’ve recently realized Target is a good source for some hard to find stuff – like maybe the Heartzels – if Walmart doesn’t have them.. I’ll be on a mission tomorrow to find them as closer to Valentines Day they’ll be GONE. They really don’t need anything extra as the sparkly red shows up SO perfectly, but have some extra white chocolate from Christmas so (rather than let it go directly to my hips) I’ll try drizzling some of them (Colleen B’s suggestion) OR maybe instead SMOOTHLY outlining the inner heart with white and a steady hand. White may end up being too distracting (???). Once again, you’ve come up with something that will, obviously, be a big hit. Hope you, your husband and your 4 legged child are on the mend. Target is one of favorite stores 🙂 I have come to expect new and great stuff on their shelves! We are all on the mend and keep asking each other “how do you feel today?”. Great idea about the white chocolate! They are so cute. I hope my Target has the heartzels! We’ll never need to think up these clever, cute creations ourselves as long as we have you, Brenda. I love the combination of chocolate with pretzels. These are so fuN! I am following your blog from London, England. It is difficult to get some of the ingredients here (UK confectionery is not as adventurous as US candy!) but I get some great ideas – I made a giant jaffa cake this weekend! Love your stuff! It makes me happy that you follow … the UK has unique ingredients too … I had never heard of a jaffa cake and Googled it! We need to learn how to adjust, substitute, adapt, etc. I have a friend that goes to London to visit her brother … she always brings me back a goodie bag! I went immediately to Target (S. Fla.) but they didn’t have the Heartzels or the mini Rollos; however, I’m still on the search and will try WalMart next. Since they’re in a real small bag, I’m also looking at grocery store check out counters. 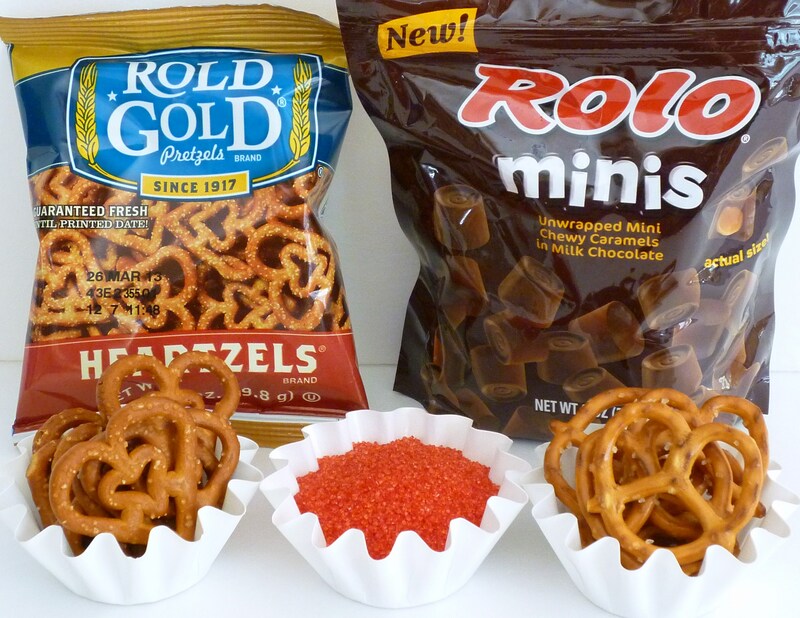 If I can find both types of pretzels but not the mini Rollos, I figure I can use reg. size Rollo and cut them up. What preparation do you use when you freeze chocolate? You’re talking about the candy coating discs – right? That would be very useful in keeping off the pounds when I over-buy. I’ve never done it as I was afraid it would take on moisture. I can’t keep chocolate here very long at all because of the heat & humidity. Freezing would definitely save me some $$. Thanks. 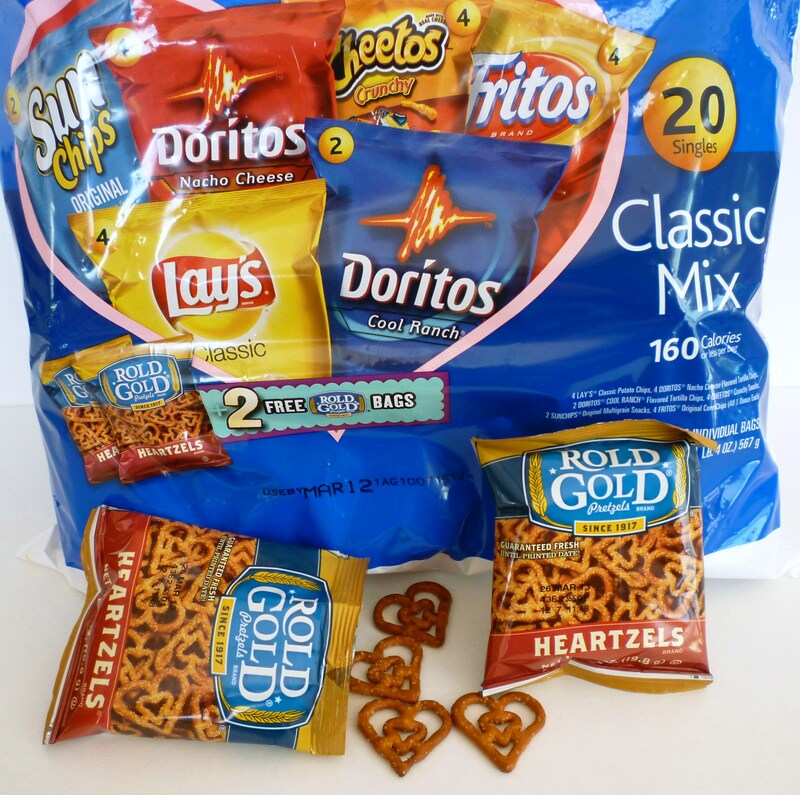 I called Frito-Lay and suggested that Heartzels be sold in big bags … they told me that the Heartzels are also sold in vending machines (especially at schools) … I hope you find them! I would try to use a whole regular size Rolo first … if that doesn’t work, I’d try cutting them.